Everything you do in life is based on you making decisions. No matter how large or small, it’s all based on decisions. I have been feeling lately that my life is missing several things. That I (in more than one way) am out of balance. I know it! My body knows it! My soul knows it! I consciously walk through the day knowing that what I am all doing is not where I am suppose to be. Now, in the immediate, yes, quite possibly I should be right here, right now. However, when you feel it in your bones a shake down is in order… It’s a frustrating feeling. Have you ever found yourself visualizing your life different? Not day dreaming, real dreaming. Like “Hope, get your a$$ moving and make those shifts you need to make-please”. And then you see yourself doing them? 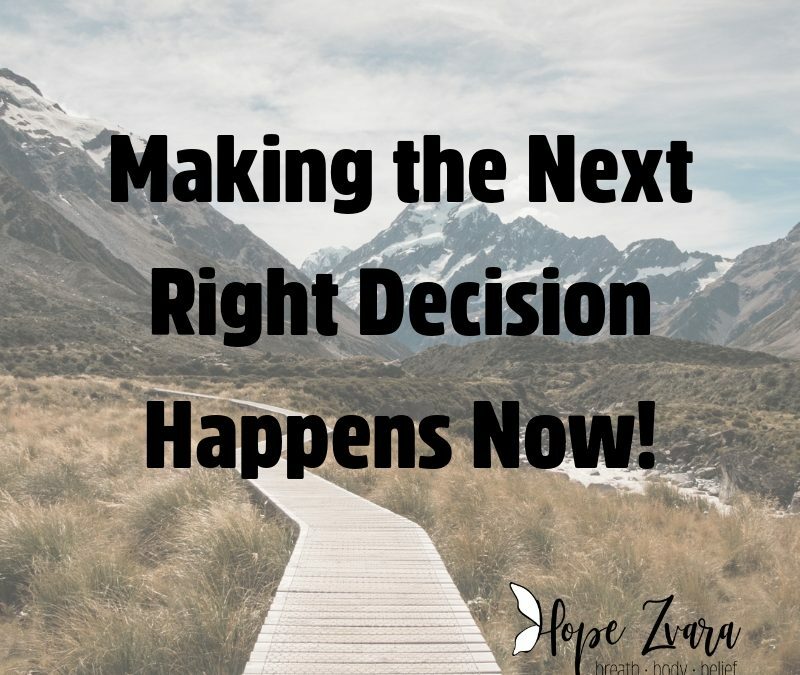 I discovered in a mindset coaching call yesterday, that by the way I so desperately wanted to do for about 2 years with this person but continued to not make the decision to book it; that “I Hope Zvara have not been making decisions since I was very, very small. Like eight years old”. This blew my mind. I mean, I know I struggle making decisions at times, but seriously… EIGHT. You may be saying to yourself, “what the heck is this all about? Well, I’ve come to realize over the last decade of my life every decision, every bodily issue is an accumulation over time. That we did not just wake up and have this ailment, or illness, or negative outlook, or positive one. My session with my mindset coach Belinda was nothing fancy, but what we uncovered was a longtime lingering inability to make decisions. And for me, it’s not that I can’t make any decision, it’s I often linger in regret, doubt, worry and fear I made the wrong one. Watching for years someone in my life turn down opportunity after opportunity as they literally fell into their lap. Unconsciously became something I adapted to my own life. Turning them down out of fear? Worry? Maybe liking the struggle a bit too much? I don’t know. But what I do know is both you and I, as adults have full control over our own situation to change it. To make a decision today. And if it turns out not so great, then make another one and move on. My mindset coach encouraged me to just make decisions. Just make a decision and move on. To say the decision out loud and then actually do it. To make the next right decision, don’t over think it, and go on to the next one. End of story. And the feeling I get is like I am the caterpillar that has spent the last several days (weeks, months, years) spinning its cocoon, and now am in it, but not sure when to come out? Maybe you feel like that today too? Maybe you aren’t quite yet in the cocoon, but are just figuring out how to spin the silk? Either way, my journey can only be a journey when I make decisions, no matter how large or small. And if I desire to soar to victory, I must be willing to make the decisions that go along with it. The decisions that may not go well, as well as the ones that will. I love the metaphor of Warrior II: With your arms stretched out at “T”, your back arm represents the past, at your fingertips but that is it. The front arm, with you intently gazing out over the fingertips keeps the future in front of you. And as for you, you are in the present moment, which is the gift. Stacked, strong, planted, unwavering, that if tempted to go backwards, or lean and reach forward, the present will draw you back. Every single yoga pose during a yoga session is a decision. To move or not move. Breathe or not breathe. Hang in there one more breath or give up. To literally roll up your mat and say under your breath, “this is crazy nuts”, or decide to expand yourself and do it anyway. Both you and I must walk strongly through life as a Warrior. No need to fight, or swing your stick, but be still, in the present moment, and make the next decision that comes your way no matter what phase of the cocoon we are in. Today, make the next right decision and then move on. Or just take that next breath. But you are in charge of your next decision, it may be small, but it’s yours to decide. Just stay present as you look out at it and you will surely remember the gift in today’s decision.